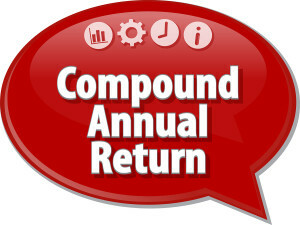 What is Compounded Annual Return? Compounded Annual Growth Return (CAGR) is the rate of return, expressed as a percentage, representing the cumulative effect that a series of gains or losses have on an original amount of capital over a period of time. CAGR is expressed in annual terms, meaning that the percentage number that is reported represents the annualized rate at which capital has compounded over time. You should be aware of the problems with the CAGR (We call it CAR here at AlgoTrader). Since the CAGR is just a way of smoothing out potentially volatile yearly returns, it unfortunately can give the impression that there is a steady growth rate even when the value of the underlying investment annual returns vary significantly. This volatility, or investment risk, is important to consider when making investment decisions and it’s something we here at AlgoTrader scrutinize carefully. The CAGR is a term best defined by example. Let’s say a trader invested $25,000 in Portfolio A on January 1, 2007 and 6 years later it has grown to $50,000. The CAGR is 12.25%, not too bad. Remember CAGR is smoothing out the progress of the investment over a period of time, providing a clearer picture of the annual return. However, although the investment started at $25,000, and ended with $50,000, its growth in any one year may have been quite a bit higher or even negative. Consequently, the CAGR may give the “false” impression that the investment has produced a stable return throughout its life, even if the investment was extremely volatile, fluctuating a great deal from year to year. To highlight the example take a look at what would have happened had the $25,000 investment been in the SPY (the S&P500 ETF) in January 1, 2007 instead of the fictitious Portfolio A. On January 1, 2007 the SPY opened at 124.57 so exactly 200 shares were bought. Let’s say six years later, on January 1, 2013, those 200 shares were sold at the open, 143.70. The CAGR works out to 2% and while 2% is not wonderful, at least it’s positive. What the CAGR does not describe is that by March 2009, the S&P had lost 57% of its value and the CAGR had fallen to a mind boggling -23.73%. So, the CAGR has its limitations. It’s also important to remember it does not reflect investment risk. The Compounded Annual Growth Return is where we begin and will not consider any algorithms that have a CAGR of less than 15% and most will have CAGRs well over 20%.